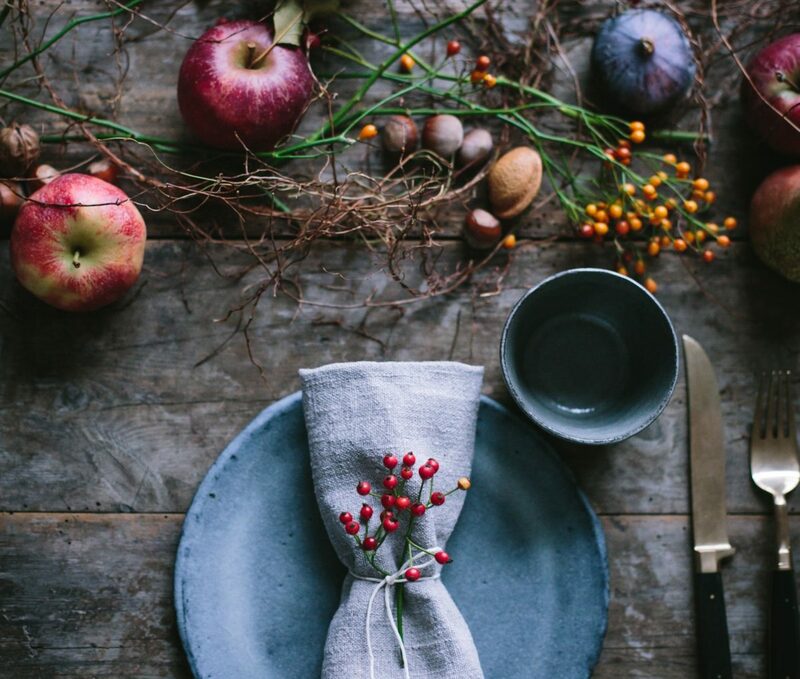 America’s original harvest beverage, heritage cider is the perfect sip for every holiday meal – from Thanksgiving through Christmas. Delight your hosts or add extra sparkle to your holiday table by indulging in one of Cider in Love’s exclusive holiday cider bundles. 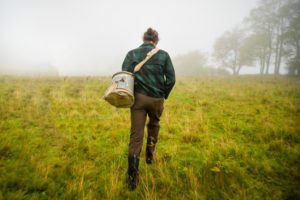 Each offers 3 unique small-batch bottles from an independent cider maker and ships straight from the orchard to your door. 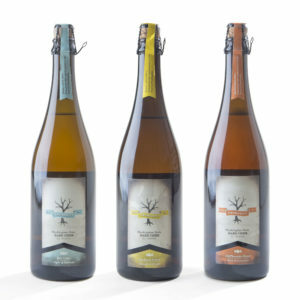 Explore the very best of heritage cider, with these three unique bottles from Slyboro Ciderhouse. 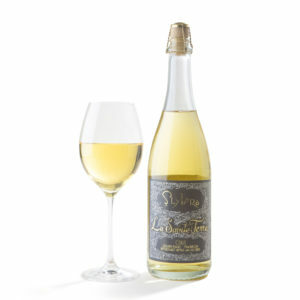 La Sainte Terre is an opulent cider, made in the methode champenoise, with initial burst of sweetness balanced by a deeper acidity and notes of tropical fruit. Kingston Black is an award-winning, dry & still cider that is juicy, but not sweet, with notes of ripe apples, savory root and umami flavors elevated by very soft tannins. Cherry Harvest is a fan-favorite ice cider infused with Montmorency tart cherries to create a decadent and sweet sip. perfect for the end of a meal. Includes: Kingston Black Cider, La Sainte Terre Cider & Cherry Harvest Ice Cider. Retail value is $67, holiday priced at $58. 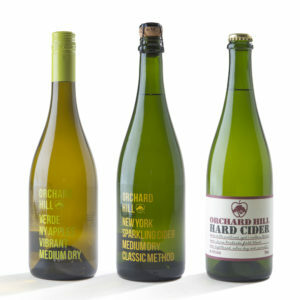 Discover ciders inspired by traditional European winemaking traditions, with 3 iconic ciders from Orchard Hill Cider Mill. Verde is bright, zesty and sparkling, full of citrus notes with a zippy finish. Red Label is bone dry and complex, bottle fermented with notes of crisp apple skin, brioche and mushrooms. Made in the champenoise method, Gold Label is an extraordinary bottle, semi-dry and beautiful sparkling with gentle floral and apple aromas. 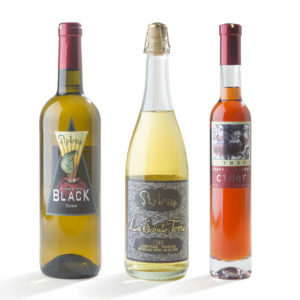 Includes 3 fan favorite heritage ciders: Verde, Red Label & Gold Label. Retail priced at $61, holiday priced at $50. Enjoy the best of South Hill Cider with this limited edition trio for the holidays. 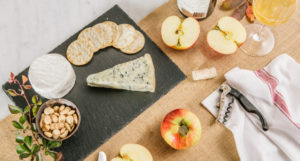 Includes South Hill’s bestseller Bluegrass Russet, a dry prosecco-like sparkling cider which offers an aromatic effervescence and notes of lemongrass, beeswax, peach and apple skin. Russet Dabinett is a dry, still cider with flavors of honeycomb, elderflower, lychee, sour plum, white pepper and subtle vanilla. South Hill Pommeau is a popular cider aperitif, like a port-style cider, with warming notes of honey, nutmeg and amaretto. 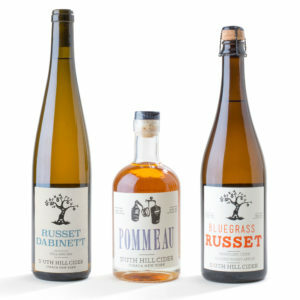 Includes 2 heritage ciders and a pommeau: Russet Dabinett, Bluegrass Russet & South Hill Pommeau. Retail value is $65, holiday priced at $58. 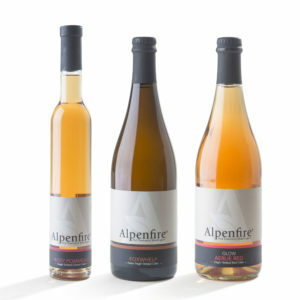 Enjoy the best of Alpenfire Cider with this limited edition trio for the holidays. Includes Alpenfire’s bestseller Glow, whose coral hue comes from naturally red-fleshed Aerlie apples and which offers a fresh strawberry aroma, juicy freshness balanced by a slight astringency; Foxwhelp, a dry, sparkling estate cider with rich, earthy complex flavors; and Rosy Pommeau, their exquisite cider aperitif with sweet floral aromas and notes of tropical fruit and honey. Includes 2 best-selling heritage ciders and a special pommeau: Glow Aerlie Red, Foxwhelp & Rosy Pommeau. Retail value $73, holiday priced at $60. Discover the best of Carr’s Ciderhouse, famous for their dedication to heritage ciders that are wild fermented. Bittersweet Blend offers an aromatic fruity notes a gentle effervescence, with notes of orange and apple peel. 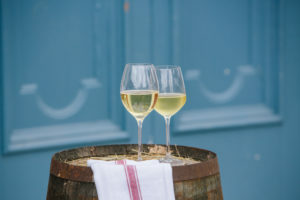 Made from wild apples, as the name implies, Wild Apple Blend is a bone dry, sparkling cider with notes of lemon, well-balanced tannins and a delightfully bitter twang. Dry and fruity, Golden Russet is pleasantly refreshing with moderate tannins balance with notes of delicate sugar cookie and anise. 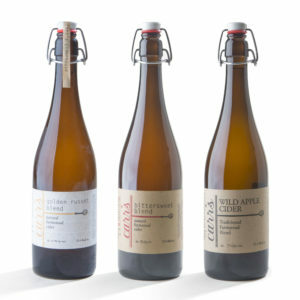 Includes three iconic wild-fermented ciders: Golden Russet, Bittersweet Blend & Wild Apple Blend. Retail value is $57, holiday priced at $50. 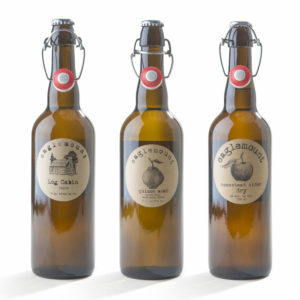 Enjoy three iconic bottles from Snowdrift Cider Co., dedicated cider makers with an orchardist’s palette of flavors. 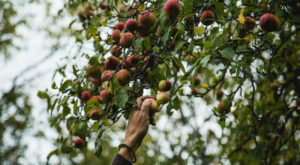 Made in the English tradition, Dry Cider is delicate with a whisper of toffee that tiptoes around a limey brightness and lovely soft fruit aromas. Semi-Dry cider is a distinct & bright cider, rich with bright rhubarb, summer peach and golden raisin flavors and an almond floral finish. Cliffbreaks is a fall favorite – a bold semi-sweet cider with grapefruit notes woven into rich flavors of caramel and dried fruits and a coconut finish. Includes 3 heritage ciders: Dry Cider, Orchard Select Cider & Cliffbreaks Cider. Retail value is $48, holiday priced at $42. 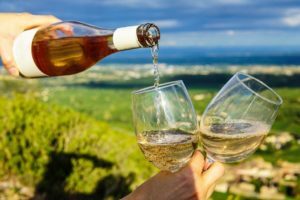 Enjoy three special bottles from Eaglemount Winery & Cidery, a this family-run cidery inspired by their 1883 homestead. Log Cabin Cider is a crowd-pleaser, semi-sweet & sparkling, with a touch of funky and grassy, woody notes. 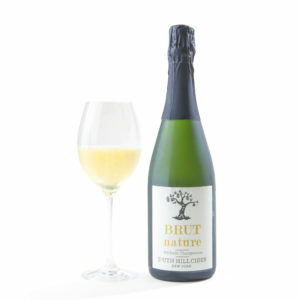 Homestead is a light yet complex dry sparkling cider with a friendly acidity that make it delight to pair with dinner. Quince is a truly special – and rare! – cider: fragrant, semi-sweet with beautiful notes of honeysuckle, pear & melon. 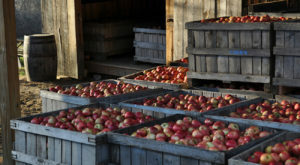 Includes 3 popular heritage ciders: Log Cabin, Homestead and Quince. Retail value is $52, holiday priced at $47.